Yesterday we had a nice visit with Tricia, Tony, and Ava. We haven't seen them since July when Tricia and Ava joined us in Ohio to help pack up the house. It seems like every time we see Ava she has grown another six inches. It is scary when you stop to realize that we are growing older at the same rate the kids are growing up. We caught up on all her school activities and her preparations for this winter's performance of the Nutcracker. Tony leaves for work at zero dark thirty so we didn't see him this morning but we got Tricia and Ava off to work and school and then put ourselves on the road about 8:30AM. Today's travel simply continued south on I–95 and our goal for today was to at least reach Savannah, GA before stopping for the night at a Hotel Walmart. That is about 250 miles and half way to our destination in Titusville, FL. If we get there early, we'll press on further. We left Tricia's with our coffee mugs full and stopped for gas and breakfast about 10AM. On travel days, we usually do breakfast late then a very late lunch/early dinner. Today was no exception; I had a delicious Meat Lovers Omelet. So far it was a good day to be living the RV lifestyle; good weather, easy travel, heading south for our winter digs in Florida. What more could one ask? A couple hours after breakfast, I started experiencing some "gastro–intestinal distress". I assumed it was the omelet getting back at me and the pain would pass. The pain didn't move and it intensified. We reached Savannah early in the afternoon and decided to press on further. I was feeling lousy but stopping wouldn't improve that so we kept rolling. About 3PM we approached Brunswick, GA. My pain was pretty intense and I was having trouble breathing. This was definitely not the omelet. We got off the highway and I used the Walmart app on my phone to locate their nearest store. 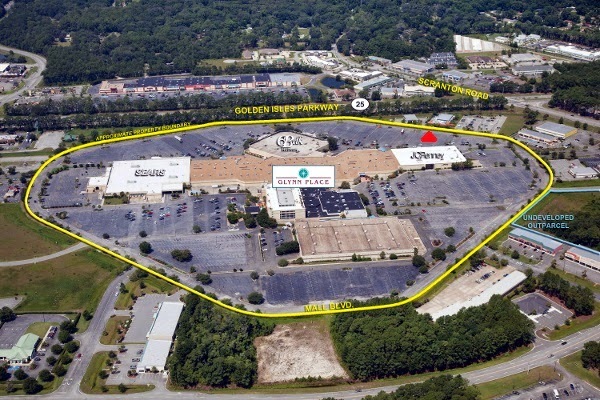 It was nearby but this area is a "no sign" area and shopping centers are hidden behind bushes and trees. We drove around a bit unsuccessfully and finally pulled into the first shopping center parking lot we could see. Michelle called 911 and reported me as having a heart attack. I had no problem with that report since I didn't have any better idea what was happening. We didn't know where we were. All we could say was "We are in a shopping center parking lot behind JC Penney". I used my hand–held GPS receiver to mark our coordinates. When Michelle tried to give the coordinates to the 911 operator, they said they didn't need them they had our location. I don't know if they got the location from our phone or from the JC Penney comment. In just a few minutes, an ambulance arrived. Good thing. By then my pain was really bad and I was having serious problems breathing. Off to the hospital in an ambulance for the second time on this trip. My turn to be in back and Michelle to be up front. I don't remember much about the next few hours but the end result was that I was admitted to the hospital, I had a gall bladder attack not a heart attack, and I was scheduled for surgery tomorrow. "Acute cholecystitis; Choledocholithiasis with obstruction" was the diagnosis. I cannot pronounce it or even spell it. I copied this from an information sheet they gave me after the fact. Anything that hard to spell and pronounce should hurt really bad and it did. What about our rig? 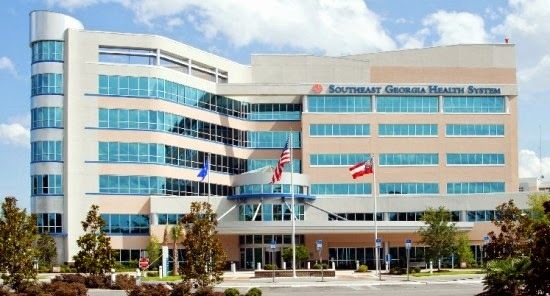 While I was being poked, prodded, and drugged, Michelle contacted hospital security to inquire about parking our rig in the hospital parking lot. They were very accommodating. They assured us that we could park but were quite emphatic that we should park in Lot F. After I was settled in, Michelle took a cab back to the rig and moved it to the hospital. While trying to find Lot F, she encountered a different security person who emphatically directed her to Lot R. That would cause a problem later. Now I'm going to preach. Almost all of our RVing friends are couples. In too many cases, the wife cannot and will not drive the rig. "Hubby does all the driving" is the standard smiling response. "What happens when hubby has a heart attack?" never produces a satisfactory answer. This is especially disheartening when you consider that a large percentage of RVing couples are seniors. My admonition to all RVing couples is that both parties must be able to drive and maneuver the rig – no excuses; no exceptions. That is as much a part of RVing safety as checking your tires and brakes. I am proud of the fact that Michelle and I both can drive our rig. Sometimes she lets me. Yesterday (Sunday, 26 Oct) we stayed in the Baltimore area and spent the afternoon visiting with Jean and Mary Morais. We got to see their apartment then went to The Mall in Columbia where Mary works at the Hallmark Gift Shop. We had a nice lunch at Maggiano's Little Italy, then Michelle and Jean shopped for a bit. We spent a couple hours back at Jean's apartment catching up on our lives, then returned to the hotel for a quiet evening anticipating our travel on Monday. 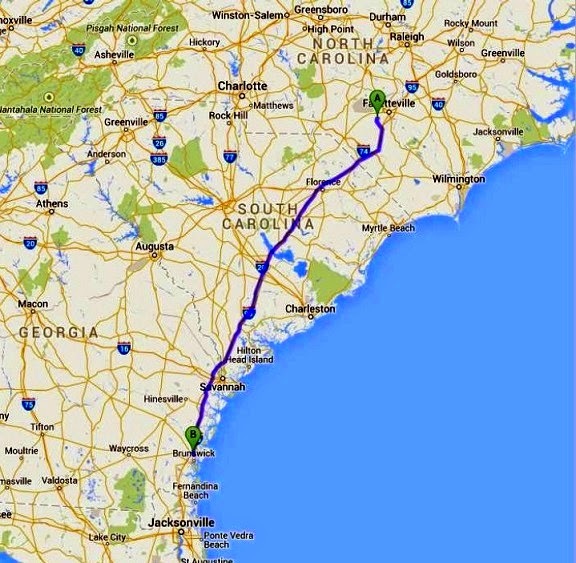 Today's weather was beautiful and our goal was to reach Tricia's house in Fayetteville, NC – a trip of 362 miles. First we had to get back to the Naval Support Facility at the Naval Academy to pick up the Cougar. 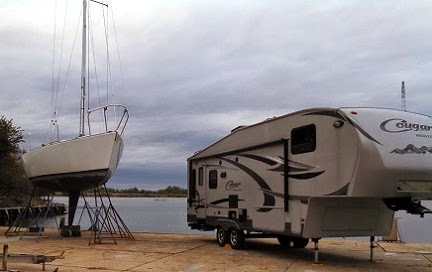 The folks at the marina were fascinated with our story of being full–time RVers. We thanked them for their hospitality and hitched up the Cougar and got underway. The primary north/south route along the eastern seaboard of the US is I–95. Before the interstate highway system came into being, this role was filled by US Routes 1 and 301. Today my goal was to get onto I–95, but from Annapolis the shortest distance would put me on I–95 north of Washington DC and we would be pulling the Cougar through DC on the infamous beltway. 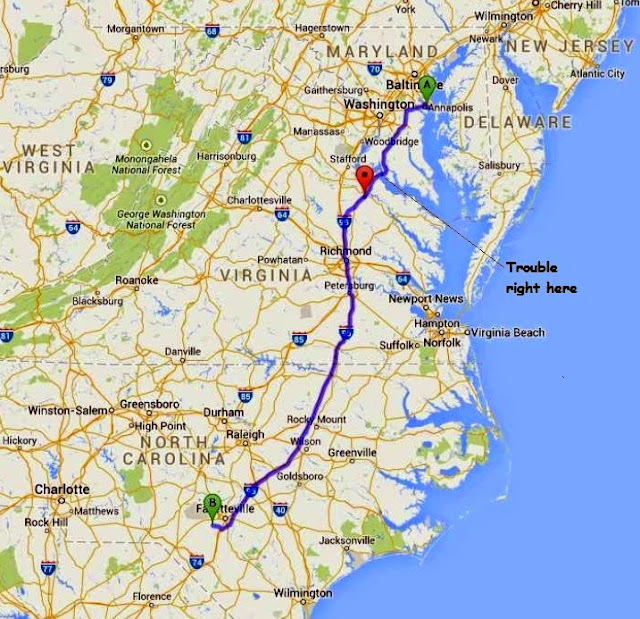 Using US–301 would let me connect with I–95 south of Washington DC and north of Richmond, VA. I opted for that choice. US–301 is an old highway so it goes through every town as a surface street, obviously slower that I–95. I was OK with that. The weather was beautiful and getting to see some towns and farms was a pleasant relief. We had a substantial number of miles to cover but it was not unreasonable. Of course we had to cross the Potomac River. I knew that and gave it no extra consideration. When we reached the bridge I got two big surprises. First, the Gov Harry Nice Memorial Bridge is very high and very narrow–one lane each way. Second, the toll for our rig was $19–CASH ONLY. A sign for the toll charges gave the rate for passenger cars only and nothing about cash only. We got this surprise at the toll booth. Single lane, cars behind us, no room to turn around, and between us only $13 in cash. The lady in the toll booth told us to drive on through and the camera would take a picture of our license plate and we would get a bill in the mail. We did, the alarm went off, and we continued on our way. We'll see what happens with the bill. The rest of the trip was uneventful and we arrived at Tricia's house about 6PM.